*GET £50 WORTH OF BONUS POINTS FOR REGISTERING YOUR CARD ONLINE! If you have an online account linked to the email address just provided then your card will be automatically linked to your online account as soon as the registration of the card is processed. *Offer available to new card holders only. To qualify for this offer a Reward Card must be registered online within 7 days of the card first being used in the store. £50 worth of bonus points is equal to 25 reward points. **Can only be used in Klass standalone stores and concessions that participate in the Reward Card scheme. Please see here for full terms and condions of use. 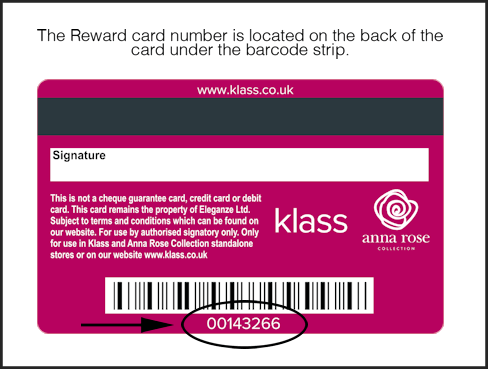 You may only use your Klass reward card to collect points on purchases in Klass Stores, online at our website www.klass.co.uk and at participating concessions full details of which are available on our website. It is a condition of having a Klass Reward Card that you can provide Eleganze Limited with your contact details. By using the Klass reward card issued to you,you accept these terms and conditions, you agree to become a member of the Reward Card scheme and agree that Eleganze Limted can contact you with direct marketing offers from Klass. To earn points for a transaction, your Klass Reward Card must be presented at the till at the time of purchase. Every £2 spent earns 1 point. For online purchases for the system to link your online purchases to your card you need to ensure the email address used for your online account is the same as the email address registered to the reward card. The Klass Reward Card scheme is open to all U.K. residents aged 18 years and over, excluding Eleganze Limited staff. The Klass Reward Card is not transferable and can only be used by the person whose name and signature is on the card. If your card is lost or stolen, please notify us by ringing the helpline on 01706 868002, and a new card will be issued. Please notify the helpline if you change your address or wish to change your details. Calls will be charged at national rates. The Klass Reward Card issued to you remains the property of Eleganze Limited, who reserve the right to decline, issue or withdraw the card. In the case of dispute, the decision of Eleganze Limited shall be final. Nothing in these terms affects your statutory rights. Eleganze Limited reserve the right to alter, amend, or terminate the Klass Reward Card scheme at any time, without the need for prior notice, be it written or verbal. The Klass Reward Card is not a credit, debit or cheque guarantee card. Your Klass Reward Card must contain a minimum of 100 points for a voucher to be issued. After the first 100 points, vouchers will be issued for every 50 points earned. This applies to every collecting period. Collecting periods may vary and in the event you do not collect any points during an 18 month period then your points balance will be reset to zero. The level of reward given will be based on the total number of points that a member has earned by the end of the last day of a collecting period. Any points that a member has earned that fall between the level of reward and the next level will be "carried over" as the starting balance for the next collecting period. The Klass Reward Card vouchers and mail out coupons can only be used in Klass stores when presented with a Reward Card bearing the same name and number. Vouchers can only be used towards your purchase of goods from the participating Klass store and cannot be exchanged for cash or used towards the purchase of gift cards. Eleganze Limited reserves the right to deliver vouchers by email only. Vouchers must be used by the expiry date as stated on the voucher. We are not responsible for any vouchers that are unused by their expiry date. At present whilst you can collect points online you cannot use vouchers for on-line purchases however from time to time when issuing vouchers you may be offered to convert your voucher to an on-line voucher enable you to then use the converted voucher towards an online purchase at www.klass.co.uk. It is your responsibility to advise us should your contact details change. We are not responsible for delayed or undeliverable mail or email. The current redemption value of points is one point equals £0.10. Eleganze Limited reserve the right to vary the rate at any time. Points are not given on non-Eleganze Limited product. All in-store promotions and mail outs are subject to availability. We reserve the right to cancel any Klass Reward Card that has been inactive. The promoter of the Klass Reward Card is Eleganze Limited, Unit B, Royle Pennine Trading Estate, Lynroyle Way, Rochdale, OL11 3EX. These Terms are subject to English Law. Our liability for a breach by us of these Terms shall be limited to you. If you suffer loss as a result of such breach, our sole liability shall be to credit you with points in the event that such points were deducted in error or should have been credited but were not. Nothing in these Terms and Conditions shall limit any liability for personal injury or death caused by our negligence nor limit any liability for fraud. All the data you supply to Eleganze will be held in compliance with all current and future Data Protection laws. We appreciate there is a lot of information within this policy but it is important and necessary to ensure you are fully informed about your rights and how we use your data. We are committed to doing the right thing when it comes to how we collect, use and protect your personal data. The data controller is Eleganze Limited (referred in this policy as “we” or “us”). Eleganze Limited is a company registered in England & Wales that owns and trades under the brands Klass and Anna Rose. -	To contact you electronically about promotional offers and products (provided you consented to such communications being sent to you) that we believe are of interest to you. -	Where we have a legal right or duty to use or disclose your information (for example in relation to a legal dispute or in relation to an investigation by a public authority). We use your personal data for electronic marketing purposes (with your consent) and may on occasion post mail to you on our latest offers or product ranges. We communicate to you in this way in the belief based upon on prior interactions with you as a customer or visitor to our website that we are sending you information on products or offers that are of interest to you. 3. Contacting us via the any of the Contact Us methods set out in this Policy. If you have a Klass Rewards Card, we may collect data directly from you, as well as analysing your browsing and purchasing history with us, both online and in store as well as your responses to marketing communications we have sent you. This data together with other data you have provided us with such as your date of birth and address, helps us to ensure that we are contacting you with relevant products and offers that are of interest to you. To better manage this and achieve more accurate result we use software and other technology that automates the processing of the data. So that certain services are available to you, we may need to share your personal data with some of our service providers. These include payment processing companies so we can process payments and refunds in respect of orders you make with us, IT companies who support our website and other business systems, operational companies such as delivery couriers, and marketing service providers who help us manage our electronic communications with you and recommend products that might interest you whilst browsing our website. We ensure agreements are in place with such third parties to make sure we have their confirmation that appropriate data protection and security controls are in place and maintained when handling your personal data. Contractually these third parties are only permitted to handle the data to provide the service needed for us and to you and for no other purposes. If we stop using their services , any of your data held by them will either be deleted or rendered anonymous. Other than with our service providers, we do not share your personal data with any third parties, except as set out below. We never sell or licence/rent our customer data to other organisations or individuals for marketing purposes. -	for your protection, the protection of customers or our employees. 4. How long do we retain your data? We will not retain your data for longer than necessary for the purposes set out in this Policy. Whilst different periods of retention apply for different types of data, as a general rule we will not normally hold any personal data beyond 6 years after your last interaction with us. 5. What sort of personal data do we collect? -	If you have an online account with us : your name, gender, date of birth, billing/delivery address, orders and receipts, email and telephone number. -	Details of your purchases and returns with us either in store if you are a member of our loyalty scheme and have used your Klass reward card or online. -	Details of your interactions with us thought our customer support, in store or online. For example we collect notes from our conversations with you, details of complaints or comments you make, details of purchases, items viewed online or added to your basket, voucher redemptions, web pages you visit and how and when you open or click on emails we may send to you. Whilst we collect your card details so we can process the payment needed to complete your purchase, this is done via an encrypted connection that is shown by the padlock or secure symbol in the address bar as being recognised by your browser as being secure and we do not store your card information on our systems. We pass on your details via the encrypted connection to our payment provider’s secure and fully compliant environment who take care of securing all sensitive data using industry leading technology to safeguard your card against digital braches so as to keep your card data completely secure at all times. -	Your comments and reviews on our products and service. - To comply with our legal obligations. -	fulfilling our duties to customers, employees, shareholders and other stakeholders. -	That we stop using your personal data for direct marking (either though specific channels or all channels). To ask for your information, please contact : Data Access request, Eleganze Limited, Unit B Royle Pennine Trading Estate, Lynroyle Way, Rochdale Lancs OL11 3EX, or by email to info@klass.co.uk. To ask for your information to be amended, please update your online account, re-register your reward card online, or contact our customer services team. Whenever you have given us your consent to use your personal data, you have the right to change your mind at any time and withdraw consent. In cases where we are processing your personal data on the basis of legitimate interest, you can ask us to stop for reasons connected to your individual situation. We must do so unless we believe we have a legitimate overriding reason to continue to processing your personal data. How to stop the use of personal data for direct marketing. -	Click the ‘unsubscribe’ link in any marketing email communications that we send to you. We will then stop any further marketing emails. -	If when subsequently registering your reward card or creating an online account you indicate you do not consent to being sent emails and/or text messages from us. -	Email your request to info@klass.co.uk including enough information so we can identify your email address or if your request only relates to text messages your mobile telephone number. An email request with a header that says “unsubscribe” is acceptable. Please note you may continue to receive communications from us for a short period after making your request for this to stop while our systems are fully updated. We trust that this policy has been helpful in setting out the way we handle your personal data and your rights to control it.